Our oil rubbed bronze registers are made with a plastic ABS resin adjustable damper that are ideal for any room. These floor vent covers can hold up to 200 lbs which means they are the perfect sturdy register for your home or office. 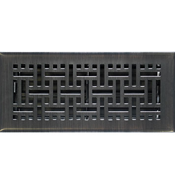 The plated oil rubbed bronze registers are crafted in the wicker design which offers a mix between a contemporary and classic look. 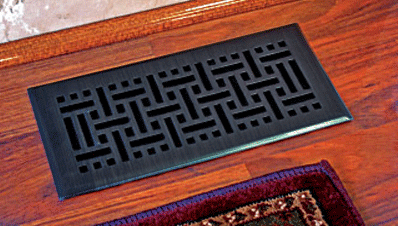 The plated floor vent covers faceplate is made out a steel construction and is powder coated to prevent tarnishing. The installation of our oil rubbed bronze registers is simple, all you have to do is drop it into the floor opening. 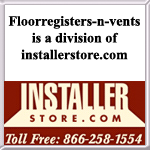 Tip: To order, a 4 x 10" floor vent cover will fit into a floor hole opening of 4 x 10". Looking for oil rubbed bronze registers in another design? Well we have a large stock of other floor vent covers waiting just for you. Buy these affordable oil rubbed bronze registers today see the difference our floor vent covers make in your home!